This blog is part of our Daily Dispatches series in which we’ve teamed up with photojournalist Morgana Wingard, who is on the ground with USAID staff in Liberia documenting the fight on Ebola. 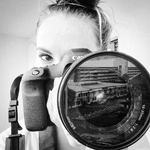 Her photo series and blogs from the team offer unique angles into the many facets of the Ebola story – from life inside a treatment center, to profiles of the health care workers battling Ebola from the front lines, to the many ways the epidemic is impacting the health, economy and future of the nation. 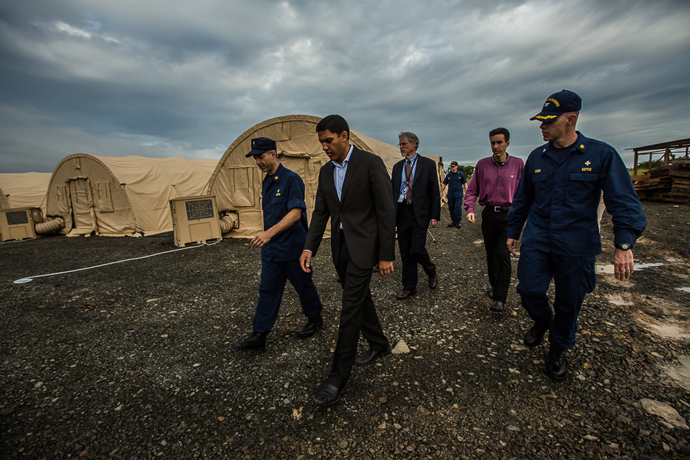 HARBEL, Liberia—”Where have you done this before?” USAID Administrator Raj Shah asked on October 15, as he stepped through the taupe colored tent flap into the new 25-bed critical care hospital being built to treat all health care and aid workers who fall ill to Ebola. “Nowhere, sir. No one has,” replied an army engineer. 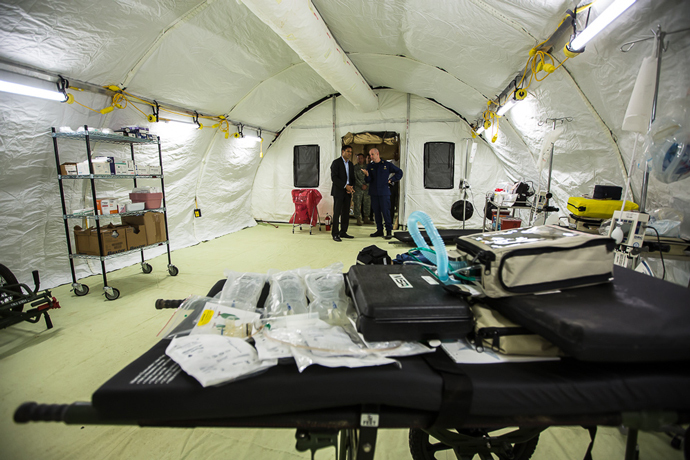 Historically, mobile medical units like this one provide versatile trauma care for military operations. 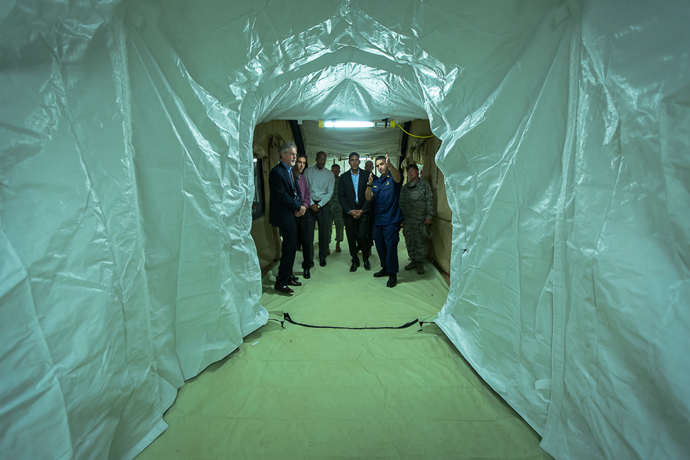 In this case, the Department of Defense (DoD) and the U.S. Public Health Service (USPHS) customized the Monrovia Medical Unit to treat highly contagious Ebola patients. Once complete, the hospital will be operated and staffed by a team of 65 specialized officers from the USPHS Commissioned Corps – an elite uniformed service with more than 6,800 full-time, highly qualified public health professionals, serving the most underserved and vulnerable populations domestically and abroad. 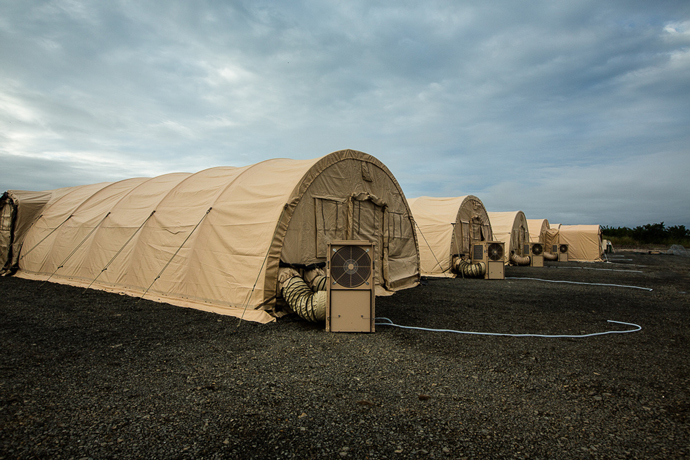 The Commissioned Corps will deploy clinicians, administrators, and support staff to Liberia to treat health care workers with Ebola, and to continue efforts by USAID, DoD and international partners to build capacity for additional care in Liberia. The new 25-bed critical care hospital being built in Harbel, Liberia to treat health care and aid workers who fall ill to Ebola. The new hospital is expected to be online in early November. 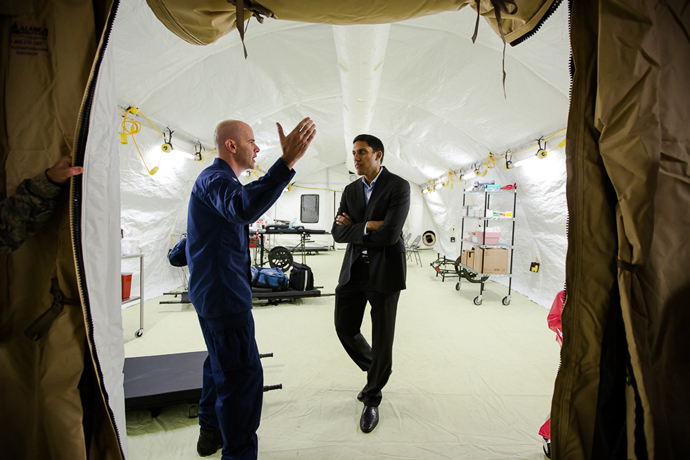 Rear Admiral Scott Giberson (Acting U.S. Deputy Surgeon General and Commander of the USPHS Commissioned Corps Ebola Response) gives USAID Administrator Raj Shah a tour of the new 25-bed critical care hospital for all health workers who fall ill with Ebola while on the frontlines of the epidemic in Liberia on October 15, 2014. 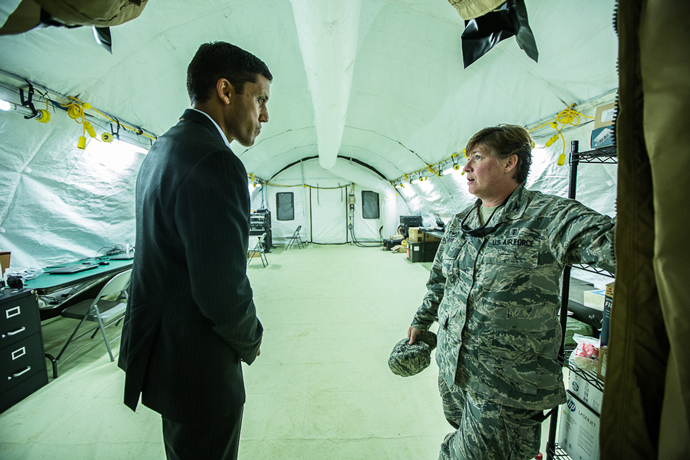 Colonel Joann Frye, nurse, Officer in Charge, U.S. Air Force Air Combat Command 633rd IPTS and USAID Administrator Raj Shah inside the new hospital. 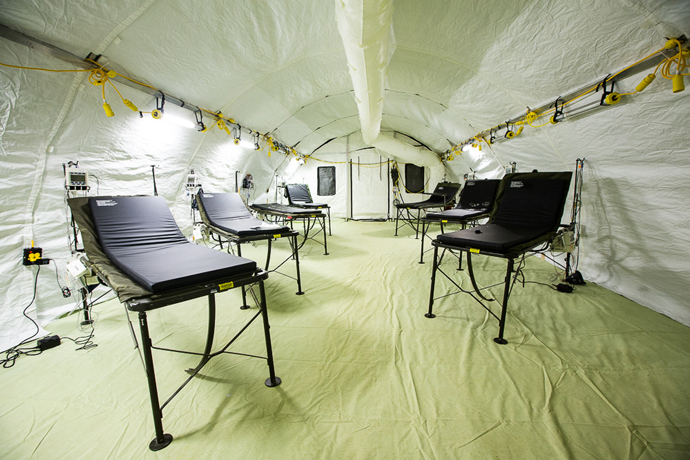 Tents are connected by a covered passageway inside the “Hot Zone.” Soon the only people inside this area will be health workers either as patients or suited up in personal protective equipment. 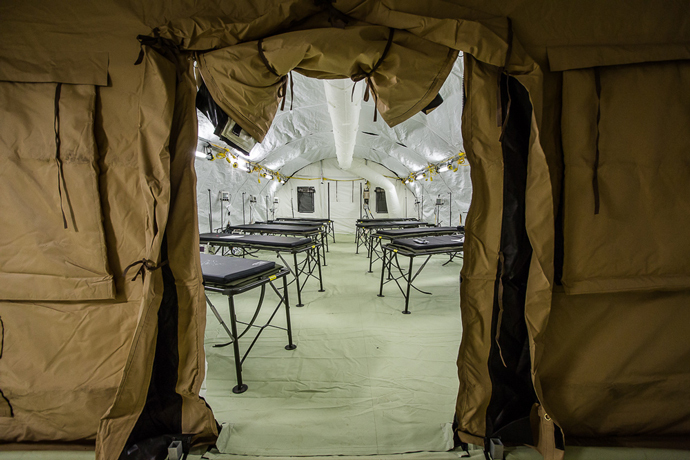 Inside one of the patient wings of a new critical care hospital being built by the U.S. Department of Defense and the U.S. Public Health Service in Harbel, Liberia. 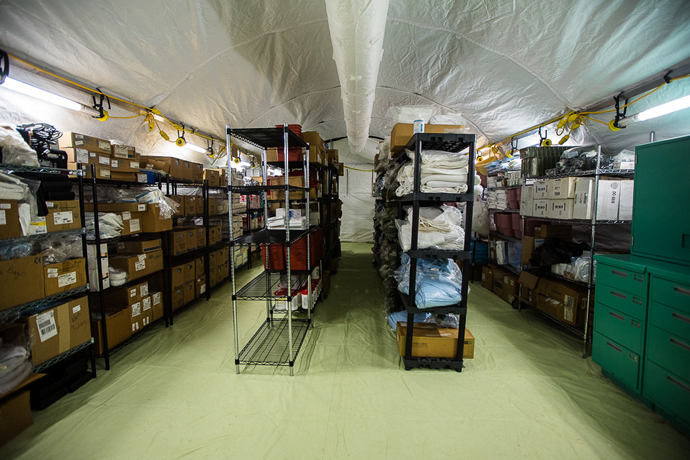 The new hospital’s supply room. 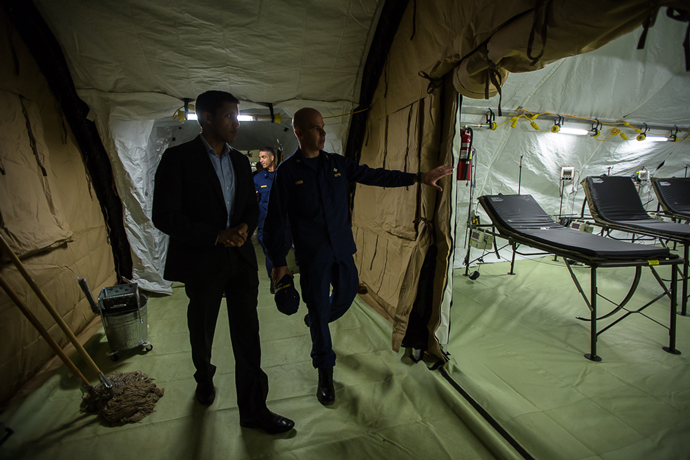 CAPT Ed Dieser (Engineer, USPHS Commissioned Corps Safety/Facilities Officer) gives USAID Administrator Raj Shah a tour of the new 25-bed critical care hospital for health workers who fall ill to Ebola while on the front lines of the outbreak in Liberia.